Papulatus is a ghost plant that pilots a clock-like robot. He stole the clock guarded by Grandfather Clock. And thus, manipulates time and steals Ludibrium's power. He stole a piece of a window (Referred to as Piece of Cracked Dimension in-game) to prevent people from summoning him. He was then encased in an orb and hid himself, only showing himself to anyone who found the piece and put it in. 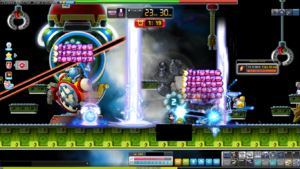 A mapler, with the task of killing Papulatus, puts the piece in and forces him out of his orb, forcing Papulatus to fight with his clock robot. Eventually, the robot becomes dismantled, Papulatus then pilots the remains, but the flying mech is easily destroyed, and Papulatus is defeated. Thus, time and Ludibrium's power went back to normal. Chaos: Level 190+, can be cleared once weekly. Re-entry cooldown if failed to kill the boss: 30 minutes (measured from entrance time). Note that if you do not currently have a Piece of Cracked Dimension, one will be given to you upon entry in any mode, before teleporting you to the battle map. Resists all elements, including Physical. As of the Nova update, Papulatus has been reworked with new attack patterns and skills. The Time Sphere phase is still the same as before, but it revives into Papulatus Clock after 6 seconds if undamaged. NOTE: The Papulatus found in Mu Lung Dojo, Mirror World, Silent Crusade, and Tower of Trials (JMS only) will retain the old attack patterns. Cranes at the top of the map will descend and ascend throughout, you will be stunned in place for 2 seconds (unaffected by abnormal status resistance) if you touched it. Summons a red laser and blue laser on two sides of the map and rotate in place. If the two lasers touch, it will activate an explosion that kills anyone in the map (similar to Arkarium). Your character will be able to block the lasers. Every 2 minutes, Papulatus will go into Alarm Clock mode, lasts 30 seconds. Winding keys will fall from the sky (similar to Magnus's meteors) to deal 10% damage and stuns for 1 second if it lands on you. Smash its hands into the ground and knocks back all players. Create time rifts on the bottom of the map which will last for 5 seconds, dealing 100% damage if you stand on them (to dodge them, you must stand on the platforms above, or stand in between two of them (this is risky due to the hand smash attack and blue clocks might spawn at the safe spot)). Create a timer above both its own head and your head; whichever timer reaches 0 first will cause your skills to be sealed until the other timer reaches 0. (To reduce this duration, pick up clocks dropped by the Tick-Tocks and Platoon Chronos around the map to either double or halve the time remaining on your head (note that it will not affect the timer above Papulatus).) The seal effect cannot be dispelled at all. (When HP <20%) Enters into sleep mode for 60 seconds, and a clock will appear in the middle of the map with 6 sections, each with a random percentage (0%, 1%, 10%, or 100% for each section). Clear as many of the sections from the clock as possible, because when Papulatus wakes up after 60 seconds, it will heal itself for the sum of the remaining percentages. To move the clock's hands, pick up clock-related drops from High Darkstars and Low Darkstars that will start to spawn in the map, to advance the clock by 10/30/50 minutes, or 2/4/9 hours. Once the clock is destroyed, Papulatus will be able to fly freely around the map, but will now be able to fight back. Summon Otherworld Papulatus, clones which will fly around and attack you. These clones have low HP, but you must kill them quickly, or else Papulatus will absorb them and heal HP for each one absorbed (1,000,000 (1 million) HP per clone in Easy, 40,000,000 (40 million) HP in Normal, and 25,200,000,000 (25.2 billion, which is 20%) HP in Chaos). Teleport you to a random spot in the map, and place a bomb on you that splits the % damage evenly among multiple players (if you are alone, you will take the full damage). This page was last edited on 3 November 2018, at 13:03. This page has been accessed 42,372 times.